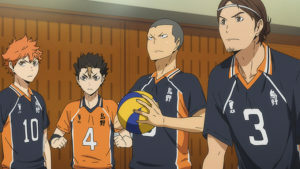 Following their loss at the Inter-High Preliminaries at the hands of Aoba Johsai, the Karasuno volleyball team launch themselves into training for the Spring Tournament. Thanks to their friends at Nekoma High, they are given the perfect chance to hone their skills when they are invited to a training camp in Tokyo and are able to compete with some of the top volleyball teams in the nation. However, it becomes increasingly apparent that despite how far they’ve come, Karasuno still has a long way to go before their skills can match those of the nation’s best. To make matters worse, their multiple defeats during practice means that tensions are running high in the Karasuno team, with some members questioning their passion while others will do anything to try and improve. Team tensions, practice, getting stronger, fast-paced and high-stakes matches, and of course – the inevitable face-off with Aoba Johsai. Haikyu!! Complete Season 2 hits the ground running and doesn’t stop to catch its breath. 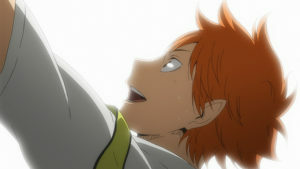 The strength of Haikyu!! 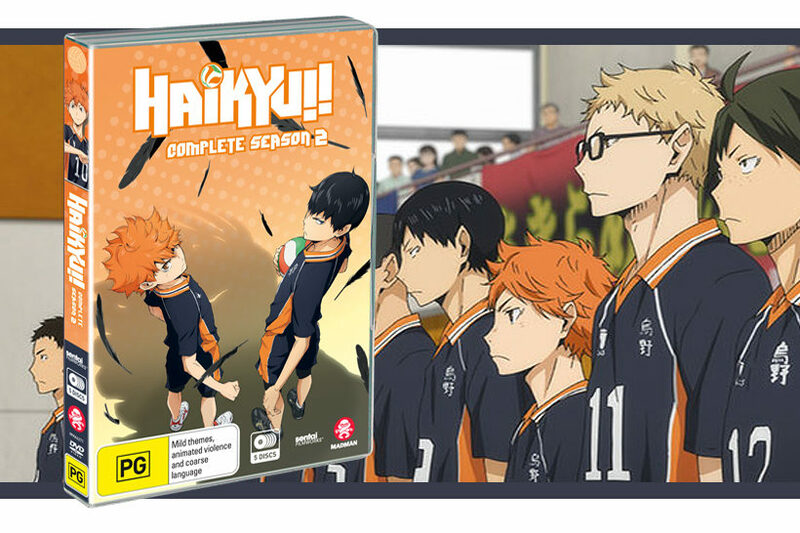 Complete Season 2 and the Haikyu!! series in general is the character moments and carefully crafted interpersonal relationships. Not carefully crafted in the way that their narratives are particularly mind-blowing, but that the show is good at convincing its audience that they are important, so when characters clash or experience small victories, it’s respectively shocking or satisfying. A good example of this is during a practice match when Hinata goes to steal a shot from another Karasuno player, and I actually gasped out loud. Characters and their team dynamics are the bread and butter of Haikyu! !, so that simple and almost inane moment was able to illicit a really genuine response. It was awesome. Other than the overarching narrative of team relationships, there are some side stories among the team that are interesting enough to warrant time away from the volleyball court but not so big that they distract from the focus of preparing for the Spring Tournament. School actually makes an appearance this season with the threat of exams, and it has a few fun moments before the show returns its attention to volleyball. Team mates Tsukishima and Yamaguchi also have some really great moments related to and separate from volleyball, such as Tsukishima and his relationship to his brother and how Yamaguchi is coping after his disastrous serve from last season. The team manager Kiyoko actually speaks more than a few lines this season, bringing in newcomer Yachi to train as the new team manager once the seniors finish with school. Yachi has some good moments too, mostly during her initial introduction where she tries to figure out whether she wants to join the club and what joining would mean for her. 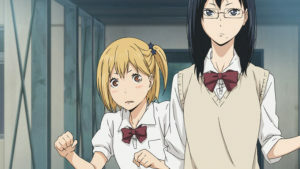 Yachi feels a little bit like a season one character – as the newcomer she is the recipient of a good portion of explanatory dialogue and there are plenty of light comedic moments over her status as team manager in-training who has never been around so many tall and intimidating volleyball players before. But alongside other new character introductions and arcs for existing characters, she makes the second season feel a little bit fresher and new. 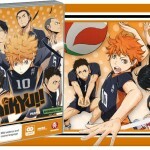 Like its predecessor season, Haikyu!! Complete Season 2 is good at making its audience enjoy the rival teams. 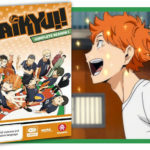 The second season features a variety of new and familiar teams, and of course a whole bunch of new characters that are introduced during the training camp in Tokyo. My personal favourite was Lev from Nekoma, and how his limbs were animated in this ‘rubbery’ way that made him simultaneously amazing and horrifying to watch during matches, but the Tokyo training camp episodes are full of new characters that are all interesting and entertaining. Also, a shout-out to Kyotani, the new member of Aoba Johsai and his wonderful bumblebee haircut and violent attitude. He really shakes up the eventual confrontation between the Karasuno and Aoba Johsai teams. 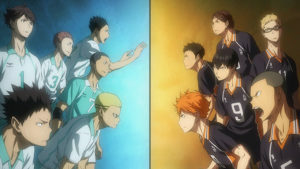 Unfortunately, some teams that were introduced during last season get knocked out early during the Spring Tournament and Saphras and I were palpably disappointed that we weren’t going to see Karasuno go head to head with them again. 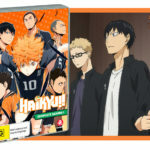 It’s disappointing, but illustrative of how great the different teams are and how easy it is to love the variety of characters in the Haikyu!! series. If you want my feelings on the English and Japanese voice cast, it’s basically the same as I previously outlined in my review of Haikyu!! 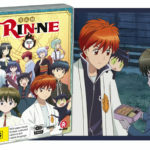 Complete Season 1 (Dual Language Edition). Saphras is still not a fan of the English dub, and I’m slightly more lenient but will always lean towards the Japanese voice cast. Honestly, Haikyu!! Complete Season 2 is basically the first season with different coat of paint. But given that the first season was packed full of hours of entertainment about these kids who just can’t get enough of volleyball, perfectly balanced with their interpersonal relationships, that isn’t really saying anything detrimental about the second season at all.